Euronext has hiked its bid for Norway’s stock exchange to $785 million. The hefty premium may no longer cover expected cost savings, and does not guarantee a victory against rival bidder Nasdaq. Shareholders in the Oslo exchange are beneficiaries of the larger groups’ largesse. 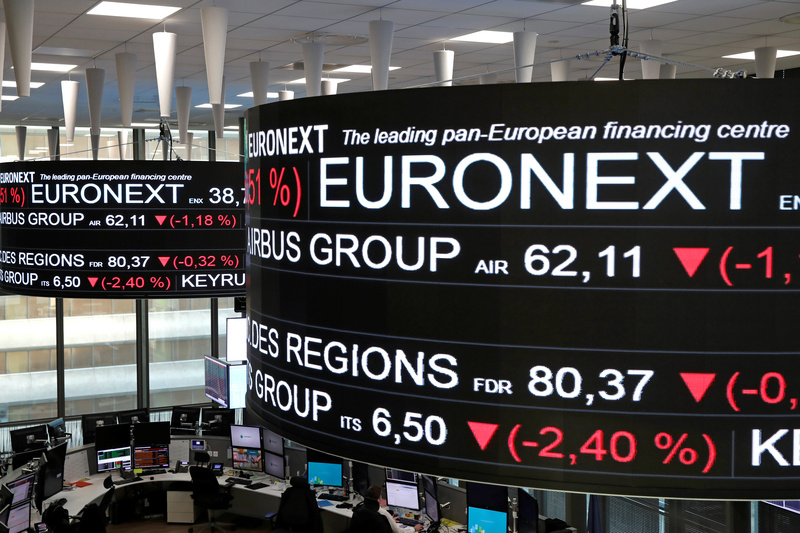 Company stock price information are displayed on screens as they hang above the Paris stock exchange, operated by Euronext NV, in La Defense business district in Paris, France, December 14, 2016. Pan-European stock market operator Euronext on Feb. 11 raised its offer for Oslo Bors to 158 Norwegian crowns per share, from 145 Norwegian crowns previously, intensifying a battle with rival bidder Nasdaq. Euronext’s latest offer values the Norwegian exchange at 6.8 billion Norwegian crowns ($785 million). Euronext said its acquisition plan is supported by the majority of Oslo Bors shareholders. The bid requires regulatory approval in Norway. Nasdaq on Jan. 30 launched an offer worth 152 Norwegian crowns per share. It said at the time it had the backing of the Oslo Bors board and around 35 percent of the shares.